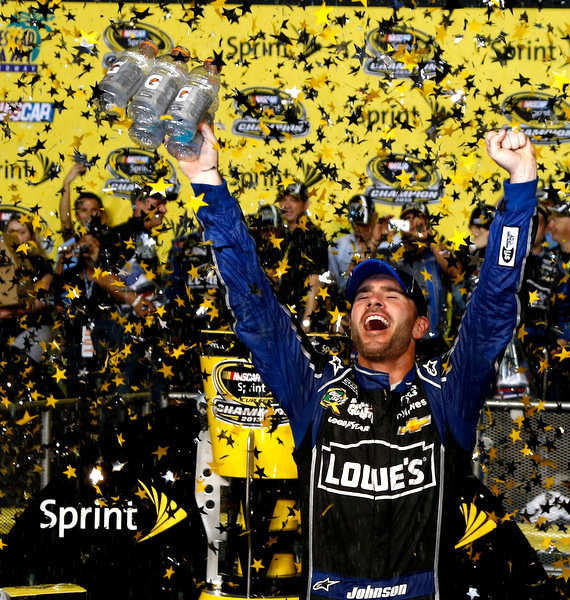 How great is Jimmie Johnson? Mr. Five-Time became Mr. Six-Time here Sunday night, Jimmie Johnson finishing ninth in the final race of the season to clinch yet another NASCAR Sprint Cup championship -- his sixth in the last eight years. And the stock car world seems convinced that a seventh title is easily in the cards...and the goal now appears to be Number Eight, which would put him in a class by himself. Denny Hamlin, sidelined early in the season after a hard crash at California, took command of the Homestead Ford 400 down the stretch to win for the first time this year. But there was not really much drama here, not like the last two NASCAR finales. Just a ton of accolades afterwards. About how great Johnson is. And how about awesome the Rick Hendrick empire is. Johnson wins his sixth title at age 37. Richard Petty got his sixth at 38 and his seventh at 42; Dale Earnhardt won his sixth at 42 and his seventh at 43. "This is extremely sweet," an emotional Johnson said afterward. He won five in a row from 2006 through 2010. "I feel like those five years were a blur, and things happened so fast. It's not that I didn't enjoy it or appreciate it or didn't respect what happened. It just went by so fast, it seems like. "I'm really going to slow things down here and enjoy it. This is so, so sweet." 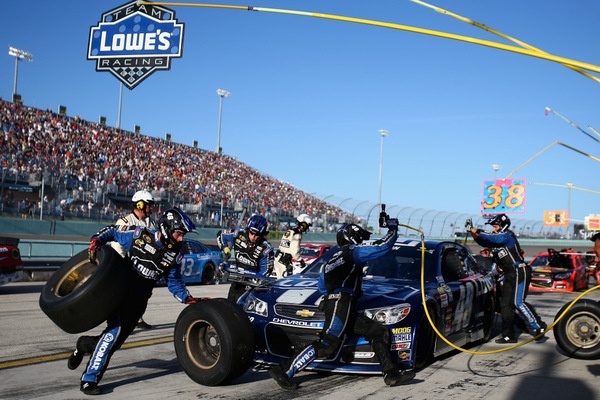 Chad Knaus, Johnson's crew chief, said there would be a heck of a party Sunday night: "It's going to be painful tomorrow morning, I can promise you that. We're going to have a lot of fun tonight. "You can't take these for granted. You can't take wins for granted, and you can't take championships for granted. They are so difficult. They're so hard to achieve... and you have to cherish each one of them." Johnson took the game at Matt Kenseth early on, and Johnson flirted with danger, banging up a fender once. But he calmed down and let teammate Dale Earnhardt Jr. harass Kenseth the rest of the race. Kenseth led the most laps and had the best car until the track cooled down, and Hamlin came on. Kenseth finished second, and Johnson won the title by 19 points. The title was the 11th for team owner Hendrick. Johnson, who never led a lap, needed only to finish 24th or better to win the title. But he ran top-three and top-five most of the night, perhaps running more aggressively than he really needed to be. Then on one restart Jeff Gordon spun his tires and triggered a jam-up behind him, which damaged Johnson's left-front fender. However the damage was slight, and easily fixed. 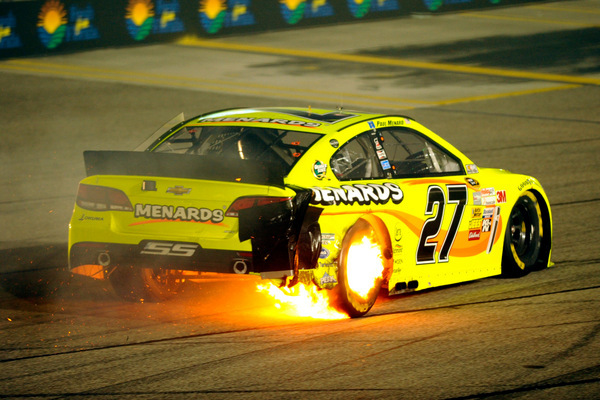 The only serious incident during the three-hour race came on pit road, when Paul Menard's right-rear tire exploded in a ball of fire, after rubber under the car caught fire. No one was hurt but the incident was dramatic. Kenseth had a great shot at taking this title only two weeks ago, but last weekend's problems at Phoenix doomed him. Still, it didn't take the edge off Kenseth's wit. He says it's still his best year ever, even better than his 2003 title (in which he won just once). And Kenseth says he's eager to get going on 2014....which actually begins Dec. 9 with that big NASCAR test at Charlotte Motor Speedway. However Kenseth, like many in this sport, seems frustrated by the continued dominance of Johnson, Hendrick and crew chief Chad Knaus. Kenseth and crew chief Jason Ratcliff matched Johnson and Knaus nearly every week through the 10-month season. 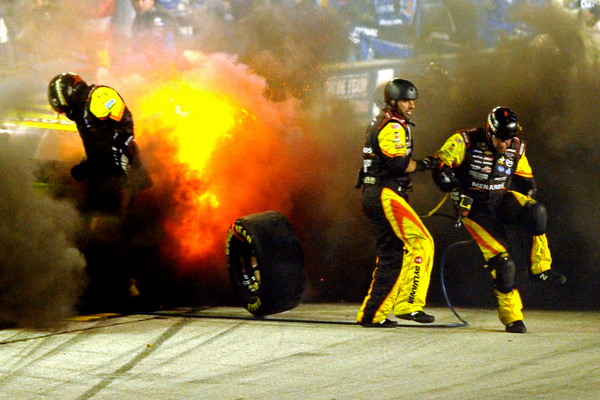 Johnson had a sizzling 5.1 finishing average during the 10-race chase. Kenseth, not counting that 23rd at Phoenix, matched that with a 5.1 finishing average too. But that Phoenix miss was key. "I would have thought the 10 races we put together (in the chase) would have won the title in years past. We put together a good 10 weeks. "But it looks like you have to finish in the top-five every week in the chase." 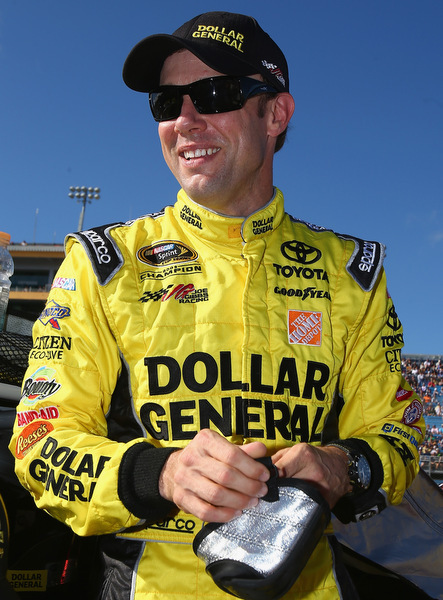 Still Kenseth remained upbeat: "Obviously it's been a great year, best year I've ever had. "Had a great weekend, great night. Had a lot of fun racing Dale Jr. Like he said, wish it was for a win. Not sure how it would have turned out if we'd been racing for the win. "But that was a lot of fun. It's always fun to race somebody you like and you can trust. "Both of us wanted to come up with a win. "And if Jimmie would have got a flat or something that would have been okay there at the end too. "On a serious note, it was a great night. Jimmie and that team are obviously unbelievable. Never seen anything like this in the sport, and probably will never see anything like it again. car teams information sharing, that they can figure out how to do that year after year." In this 400 the Hendrick and Joe Gibbs camps were head and shoulders above the rest. At times they held the top-six spots on the track. Early on Gibbs' men -- Hamlin, Kenseth and Kyle Busch -- ran 1-2-3 for long stretches. "Unfortunately we're racing in the Jimmie Johnson era," Hamlin said. "I can say he's the best there ever was. He's racing against the toughest competition. "With everyone else, you can count on having one bad race in the chase. But they don't have that bad race." Hamlin came back from his spring injury to finish second in May's Darlington 500. But the rest of the season wasn't as good. 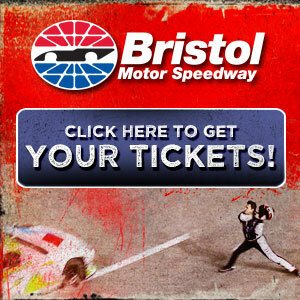 "I think we finally turned the corner right after Richmond," Hamlin said. "I got an injection, and that allowed me to get back in the gym. "It's tough when you go in the corner and you can't do it just right because you've got thunderbolts of pain." The season ends a painful season for Ford teams, which were rarely that competitive. Brad Keselowski and teammate Joey Logano did fairly well here Sunday night, for Roger Penske. But Jack Roush's men, who came here having won six of the last nine races at this 1-1/2-mile track, had a strangely off night. "It was a frustrating race because we never really had any speed," Carl Edwards said. "This is the first time we've run that poorly in this race. "This track is usually our bread-and-butter." Submitted by SB on Mon 11/18/2013 - 05:49. Without a doubt Jimmie Johnson and Chad Knaus are the best 10 race champions ever in the history of Nascar. Submitted by Michael in SoCal on Mon 11/18/2013 - 16:18. Reading on the Twitter that you may be retiring. If so, may you see nothing but green flags in your future endeavours. 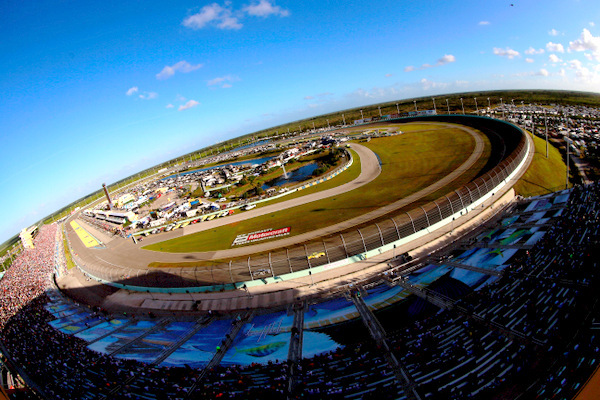 Your musings on Nascar have always been well thought-out and enjoyable to read. Thank you Mike.